Apparently you can't even get through an Apple earnings call without Pokemon Go coming up, but at least the topic yielded an insightful response from CEO Tim Cook. We are high on AR for the long run... So we're investing. "AR can be really great," said Cook in response to a question about the impact on Pokemon Go on iPhone, which he dubbed "Pokeman" more than once. "We have been and continue to invest a lot in this." Augmented reality inserts virtual objects (like Pokemon) into real-world environments, and so far this has been done using the iPhone camera and screen. "We are high on AR for the long run," Cook continued without elaborating. "We think there's great things for customers and a great commercial opportunity. So we're investing." For now, Apple's interest in AR seems limited, according to Cook: "The number one thing is to make sure our products work well with other developer's kind of products like Pokemon." "It's incredible as to what happened there," said the CEO. "It's a testament to what happens to innovative apps and the whole ecosystem and the power of being a developer, being able to press a button, so to speak, and offer a product around the world." He caught himself, saying the Pokemon Go phenomenon isn't truly global just yet – for good reason. "And this certain developer has elected not to go worldwide yet because of to the pressure on their servers because of the demand. But I'm sure they will over time." Headed for an iPhone 7 headset? 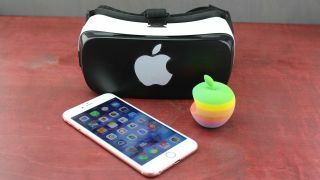 Apple is one of the few phone makers without an VR headset to make future AR experiences even more immersive, like the Samsung Gear VR, ZTE VR and Huawei VR. The Google Daydream platform could bring the rest of Android phones to the VR table later this year after Android Nougat launched. iPhone may be the odd one out – for now. There have been rumors that it could enter the marketplace soon. We don't expect that to happen at Apple's iPhone 7 and iPhone 7 Plus launch event rumored for September. Apple is more likely saving new hardware for a completely new iPhone in 2017. That's when the company is reportedly switching to an OLED display with a higher resolution fit for VR and AR gaming.